Here, a twenty minute walk from the present center of Mexico City, is an important battleground. A plaque has this message: El 13 de Agosto de 1521 heroicamente defendido por Cuauhtemoc cayo Tlatelolco en poder de Hernan Cortez. No fue triunfo ni derrota, fue el doloroso nacimiento del pueblo mestizo que es el mexico de hoy. 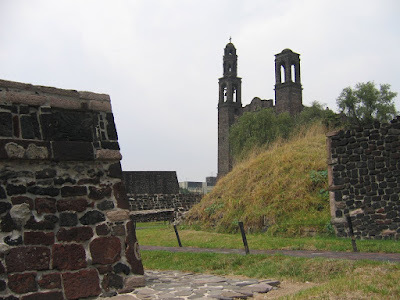 In english: The 13th of August 1521, heroically defended by Cuauhtemoc, Tlatelolco fell to the power of Hernan Cortez. It was neither triumph nor defeat, but the painful birth of the mestizo race that is the Mexico of today.